No backflipping here, just force-feedback and a VR helmet. 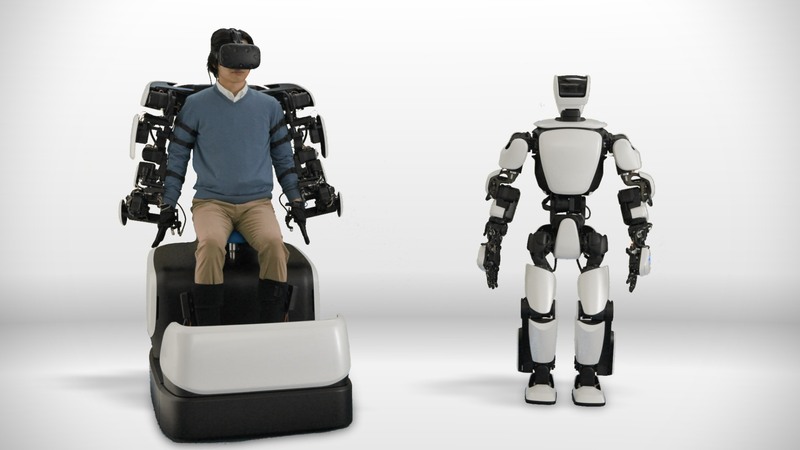 While Honda's ASIMO has taken much of the attention for automaker-built robots, Toyota has been working on humanoid helpers of its own for years, and now it's unveiling a third-generation model. The THR-3 expands on previous models built to test specific joints and movements by putting together a full body to be controlled by a human operating its Master Maneuvering System. The force feedback-enabled control system includes a head-mounted display (HTC Vive), "data glove" and torque servos that allows the operator to "instantly manipulate" the robot by mapping their motions and force precisely. The 5-foot-tall, 165 lb robot is still intended as a test platform, but the idea is to build on this with robots that "home, medical facilities, construction sites, disaster-stricken areas and even outer space." The video shows off T-HR3 practicing its balance, and sensitively picking up a ball without popping it, although there's nothing in the demo that matches the backflipping Boston Dynamics robot -- yet. That may explain why Toyota also pursued acquiring the robot builder before Softbank snapped it up and still has plans to invest over a billion dollars in robots and AI research.